1. Impressive dimensional stability, tensile strength and puncture resistance are a function of the base fabric of XR-5®. This Seaman Corporation proprietary knit design of polyester fibers also provides maximum strength to weight ratios, and flexibility for ease of handling. 2. 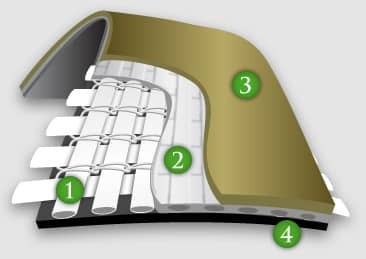 Exclusive molecular primers saturate the woven fibers in the second step of manufacturing, so there is no delamination, and no edge coating required. This saturation makes possible the bonding of substrate and coating compound into a single system. 3 & 4. XR-5 one-side coated per pass assures bonding process and high-quality finished product. Exclusive coating compound contains Ethylene Interpolymer Alloy, and is not susceptible to environmental stress cracking. Learn more about how XR Geomembranes are manufactured. For over 25 years, XR technology has set the industry standard for geomembrane strength, durability and performance. Plus our long record of successful installations containing a variety of harsh liquids has given Seaman Corporation a recognized position of leadership in this very specialized field. XR technology is used in all types of applications including pond liners, secondary containment, floating covers, wastewater baffles and potable water containment.